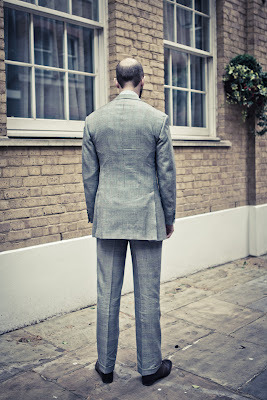 The final part this, in the series on having a Prince of Wales suit made at Henry Poole. In the end we went with a 4×4 finish on the front, with grey buttons instead of brown. I decided 2×2 would be a little too flashy, but am experimenting with the 4×4 as two display buttons can always be added later. So far, I’m pleased with the effect. It has much the same effect as a 6×4, but gives a cleaner look to the chest. I used to go for brown buttons on most suits, particularly navy ones, as it suited brown leather shoes and gave the suit a touch of personality. I’m changing my mind on grey suits, particularly as I’m wearing more non-brown shoes than previously. I was pleased with the shape of the chest and lapels. It is typical of what should be thought of as distinctive of Henry Poole: a balance, an average; in a way nothing distinctive at all, merely what they consider the poise of understated elegance. My Anderson & Sheppard DBs are more distinctive, for example, with greater belly to the lapel and a thicker collar. This is accentuated by drape in the chest and a slightly more nipped waist. 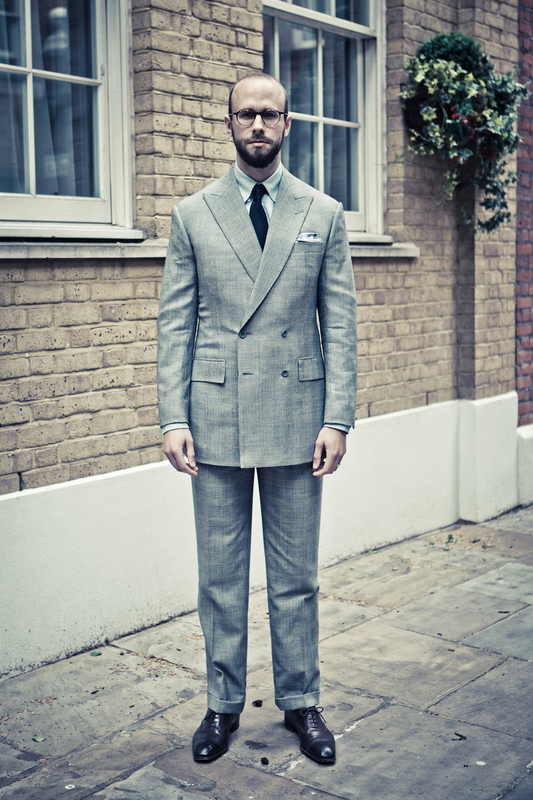 But I like this Poole shape – in a more conservative cloth, it would make a great business suit. I didn’t realise until now that Poole usually has just one buttonhole in the lapels of a DB suit. They are happy to add another, and I may do that later on, but it is interesting that one more oft-mentioned marker of a bespoke suit is nothing of the sort (compare with working buttons on the cuffs at Anderson & Sheppard). Bespoke is all about the fit, of course, rather than these extraneous details, but the coincidence is nice – just as some ready-to-wear DBs are adding another lapel buttonhole to make them look expensive, you discover the founder of Savile Row doesn’t do it anyway. I’ve had the suit for a couple of weeks now and it’s still settling down. But I will probably be taking the waist on the trousers in a little and lowering the fork. These small adjustments are inevitable with a first suit, if only because you are measured and fitted while static, in an alien environment. The adjustments will be made and my pattern changed accordingly, ready for the next suit. You can follow the discussion on Prince of Wales at Henry Poole: Part 9 by entering your email address in the box below. You will then receive an email every time a new comment is added. These will also contain a link to a page where you can stop the alerts, and remove all of your related data from the site. Wow! Great Suit. I am amazed by how great it looks even though you seem to lack shoulders. It’s great with a more or less natural shoulder on a suit but if I were you I would take up swimming or something similar to build up some muscles in the shoulder area. The criticism of shoulders is result of too many action films and health magazines. Swimming is healthy and recommended, but not to develop muscles. The wrinkles on the sleeves look odd. Is the pitch correct? Otherwise, a lovely suit. You should have pressed the suit before taking the photographs. The rumpled look does it no favours. None of these guys seems to do anything about your sloping shoulders, which must be disappointing. I note the reference to A&S suitS. You’re certainly on full steam ahead, Mr C! I should not be surprised you and Poole made it work. Please expand on the “non-brown” footwear comment. I have the impression that the photo treament enlarge wrinkles, but still it can hide that it is a very well cut suit. I like the height of the button stance too. Whilst you are ‘lowering your fork’, I would get them to have a wee look at the back of the jacket, specifically, your oxters. Too much cloth gathering, in my view. Also the suit needs a bloody good press! I thought my dad and I were the only two people in the world who said “oxters”! Good comment. Great vocabulary! Am I right in noticing the wrinkle created when the top button on our top left (our left) is buttoned? Is that normal? Also, is it customary to only button the top button on this style of DB? Great suit! The beauty of bespoke is that the final product is a reflection of your style not Ralph Lauren or Armani. Here, your unique style, not HP’s, is on full display. Congrats to Henry Poole for a job well done. There is certainly a wrinkle there. But as many have pointed out there are many wrinkles, inevitable with a cloth this lightweight and created as soon as you move a fraction of an inch. Andy’s high-contrast photography doesn’t help either! If the cloth wrinkles so much, it supports the case for a heavier cloth. You say it is 10 oz. super120. Perhaps 13oz. might do better? Wonderful suit. I like the more conservative cut and the 4 button configuration. A question: Given the range and variety of fits and house styles as well as the somewhat daunting process of choosing a tsilor, do you have a view on who represents a good ‘first suit’ tailor? Young (ish), slim body like yours should be more dareing with style: 4 x 4 double breasted like that is boring boring boring. Slightly more waisted and shorter coat would’ve lightened things up. – On the sloping shoulders, no I’ve not been disappointed that they aren’t better catered for. The only way to do this is to put in a great wad of padding, as my Huntsman shooting coat has, and I prefer a less artificial feel. 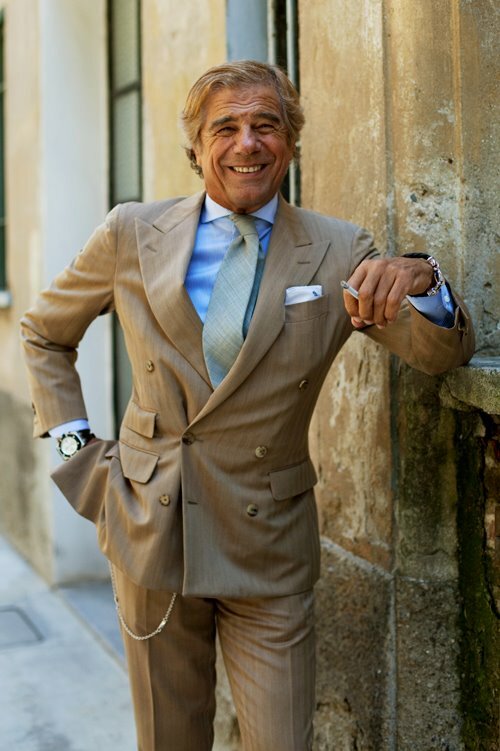 – No one is obviously a ‘first suit’ tailor, but I would recommend Poole as somewhere that can be flexible with style and is easy to chat to about fit. Perhaps the best place would be wear you feel most comfortable telling the tailor you want something changed. If you won’t do that you’re never going to be happy. – On the weight, I do tend to go for heavier cloths, in fact I have three DBs all 13oz or heavier, so this was a conscious effort to have something lighter. – Claudio, I take your point but I’ve always liked more classic designs, and trust me this is very daring for working in a City where everyone wears SBs, undone and without ties! italians maker. It is so alegant! This is in excellent taste – I normally dislike the 4 button DB. Your prose text about tailoring details and contrasts for example “with greater belly to the lapel”, “working cuffs of A&S”, “extra lapel buttonhole” are undecipherable for me. You don’t illustrate your text. It reminds me of a certain professor who NEVER went to the blackboard. This is impossible in mathematics. You must belong to the musical-auditive disposition which loves language, and I doubt that you spent time drawing. Your prose is fluent and fine, but who knows what you mean? You are surely not a fashion designer, because they are visual-pictorial. If you don’t do a serious up-and-down pose people complain that they can’t see the fit though. I have a question regarding the proper fit of a jacket. 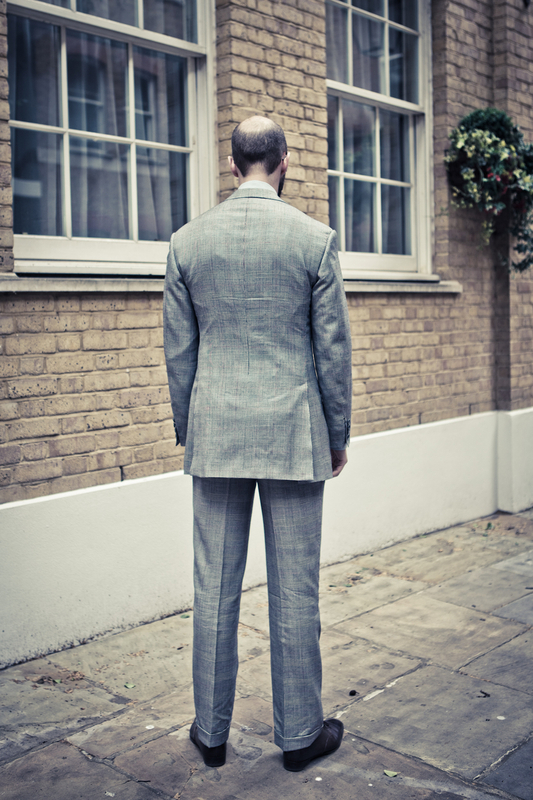 If you look at the image of you facing forward, it’s possible to see some dimpling in the coat where it is buttoned. I see this same effect in my tailored suit jackets. Is it normal and acceptable to have some of that (given that in certain light, the drape of any cloth will reveal some pulling or dimpling where the material is relatively snug, such as where a fitted coat buttons), or does it signify a coat that fits too closely? 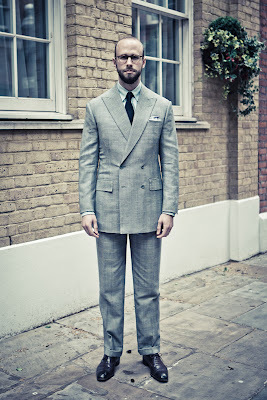 Some months ago I comissioned a very similar suit. The first months were a little bit dissapointing since this pattern and the db jacket were difficult or even impossible to wear in a business environment. However, in the right occasion this is a stunning suit. Nothing in my wardrobe has ever received more rewarding words from other people.